They say that all good things must come to an end, and it looks like the end is definitely upon us. Today the BBC officially announced that after four years of portraying The Doctor,of our beloved Eleventh Doctor Matt Smith will be leaving the show. 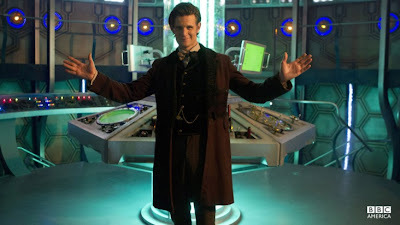 Smith is slated to appear in the 50th anniversary episode and the Christmas special, which is when we shall bid a final "Geronimo" to the Eleventh incarnation of our favorite madman in a box. Smith himself released an official statement saying, "It's been an honour to play this part, to follow the legacy of brilliant actors, and helm the TARDIS for a spell with 'the ginger, the nose and the impossible one.' But when ya gotta go, ya gotta go and Trenzalore calls. Thank you guys." (Full statement available at the BBC website). Will John Hurt step in as the Twelfth Doctor, as many fans have been speculating since the season finale in May. A lot of viewers and Whovian bloggers seem to think this is the case. While some are outraged, others seem pleased with the idea of bringing back an older Doctor, because that means less chance of love story plot lines, and apparently, a lot fans are tired of those. What if the next incarnation is finally a ginger? With so many questions left to be answered in a short period of time, fans are looking to showrunner Moffat to give them the answers they’ve been waiting for.